The International Stroke Conference (ISC) attracts thousands of neurologists each year to network with fellow experts and watch compelling presentations on the very latest advances in clinical care, science, and education. Joining those presentations for the first time was a rather provocative topic – gender disparities among the very presenters themselves. The spotlight came in the form of research presented by The University of Texas Health Science Center at Houston (UTHealth), which was itself the focus of two posters and a mini-symposium. The two studies – one looking at invited speakers and another looking at submitted and accepted abstracts – revealed a significant underrepresentation of women. “It’s important to shed light on statistics like this to generate a heightened awareness of gender disparities which have been entrenched in neuroscience for many years,” said Louise McCullough, MD, PhD, professor and chair of the Department of Neurology, who serves as the vice chair of the programming committee for the ISC. The study on invited speakers found that less than a third of the 1,283 invited speakers at the ISC were women. “On average just 29% of invited speakers were women. Although it may be reflective of the field, I still find this quite staggering,” said first author Lauren Fournier, MD, fellow of Vascular Neurology at McGovern Medical School at UTHealth. Findings showed the proportion of female speakers was highest in nursing (86.4%) and lowest in neurocritical care and aneurysm (0%). All midlevel faculty and nurses were women, but less than a fifth (17.7%) of physician speakers were women, according to the study. The data also illustrated racial disparities. Women were 32.7% of Caucasian speakers, but only 16.7 and 12% of black and Hispanic speakers. The second study looked at data for first authors of submitted and accepted ISC abstracts. It showed that about a third of both submitted abstracts (36.9%) and accepted abstracts (36.5%) were by female authors. Findings also revealed the vast majority of nurses with accepted abstracts were women (93.2%) while about a quarter of physicians with accepted abstracts were women (27.4%). By career level, the highest proportion of women with accepted abstracts were students/trainees at 40.7 percent. Fournier was one of four female and four male fellows with the stroke program at McGovern Medical School. She is mentored by McCullough and Anjail Sharrief, MD, MPH, assistant professor of neurology. “Dr. McCullough and Dr. Sharrief are tremendous champions of women in science. Joining Fournier at the ISC was her 1-year-old son Henry. Sharrief, assistant professor of neurology and director of stroke prevention at UTHealth Institute for Stroke and Cerebrovascular Disease, was senior author for both studies. Other UTHealth co-authors were Liang Zhu, PhD, and McCullough. The UTHealth Institute for Stroke and Cerebrovascular Disease, founded in 2017, serves as a multidisciplinary hub for research and best practices in acute stroke treatments, stroke prevention, stroke recovery, population health, and health services. It includes pilot funds for new studies, clinical trial design expertise, and new training opportunities in stroke and cerebrovascular disease. Core services include biology, data/statistics, clinical care, and imaging. 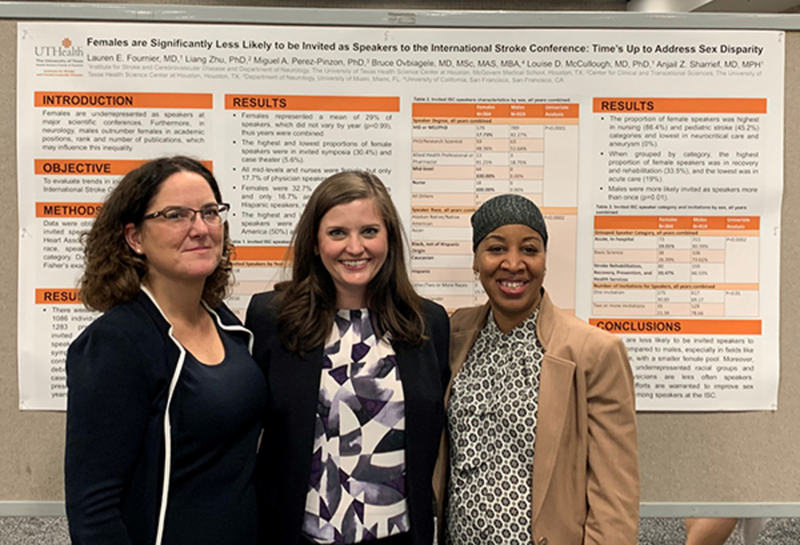 Pictured:Louise McCullough, MD, PhD; Lauren Fournier, MD; and Anjail Sharrief, MD, MPH, at the ISC.